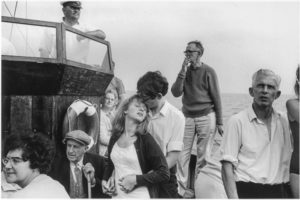 Reproduced here in full, with permission, is the complete text of Ian Walker’s research into perhaps the most iconic of all Tony Ray-Jones’s photographs ‘Beachy Head Boat Trip, 1967’. This article first appeared in Source magazine in 2004. Together with an article in The Guardian newspaper the same year, it inspired me to start the section of this website devoted to Ray-Jones as so little information about him appeared on the web at that time. It was recently updated and reproduced in the catalogue that accompanied the exhibition ‘Only in England’, held at The Science Museum London in 2013. It is the version from that catalogue that appears here. Truffaut perhaps — rather than here on a pleasure boat off the English coast. Museum, to find a copy of Tony Ray-Jones’s book A Day Off. documentary, the English seaside and so on. the period and, as I look, I assign them characters. The woman at bottom left with glasses and a worried look resembles my Auntie Lil and, in my mind, that is who she becomes. are singing the old English ballad Scarborough Fair’.) All that seems a long way away from the microcosm of this picture, but one of the things going on here (very gently) is a contrast between old English repressions and a newer, younger freedom of thought and action. embarrassment the people on the boat feel isn’t because a man has lost his legs in a war; it’s only because a young couple are being a little too affectionate. Off. As I start to scan the sheet containing this picture, I am transfixed and my larger purpose is set aside for a while. one realises that it is her shoulder and hair that just edge into the frame.) Her removal will change the final picture quite a lot. If she had been included, the contrast between the young lovers and the older characters would not have been so concentrated. rectangle, a cross and a tick. It is the shot and it will be printed nearly full frame. on and we aren’t halfway through it yet. keeps his eyes in the direction of his boat.) Moreover, if now, in the second half of the film, the boat is travelling west to east along the coast, then in the first half we had been going east to west with the open sea out to the right. And therefore, we must have started out from a port to the east of Beachy Head. This is confirmed when we get back to dry land in frames 32 to 35.
presenting or receiving a cup. Obviously we are somewhere else. same time and Ray-Jones must have used a second camera. documentarians such as Cartier-Bresson, Winogrand or Ray-Jones. wider, perhaps a 35 mm or 28 mm. situation, he evidently didn’t jump between them but rather shot long sequences on one before turning to the other. couple’s togetherness. Even the captain has a mate in some shots. acceptable face of young romance. Mostly, the girl seems lost in thought, a little wistful perhaps. from behind could be read as either protective or possessive. the picture — except perhaps the lovers themselves, who would be in their sixties now. Was this a brief summertime fling or the start of a lifetime’s companionship? Impossible to know of course, but equally impossible not to ask the question. us anything other than the 73 other moments on either side of it). attempt to express the meaning of the event as a whole. It can’t carry that weight. From where we stand, the young couple may be central; for everyone else in the picture, they are peripheral. Day-trippers thrown together by chance, they all have their own lives. that boat off Beachy Head in 1967. It happened. Council of Great Britain, and was accompanied by a fold-out brochure with a text by Peter Turner, Assistant Editor of Creative Camera. 4 G Winogrand, Women Are Beautiful (New York: Farrar, Straus & Giroux, I975). 5 This is a quotation from Michael Powell’s film Peeping Torn (I959). discussed in relation to Surrealism on pp I67—9. Heinemann, 1978; reprinted London:Pimlico,1997), pp145—6.